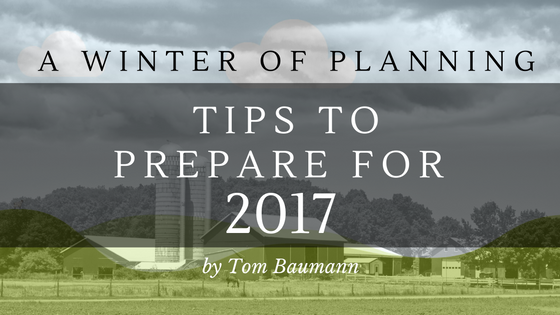 By Tom Baumann, EAT Ltd.
As the season wraps, growers are starting to think ahead to next year. It has been a season with halfway decent weather: there was a dry pollination period, but with rain here and there all summer we didn’t face a drought as we did in 2016. The plants were feeling some of the effects from the 2015 season, but we are poised for a better overall resilience of plants going into this winter. All season I’ve been adding to a list of those items in my own small fields that need improvement and repair. Every grower knows what I am talking about. Now I finally get the time to make such improvements. As crops have taken over marginal land, i.e. land that may be poorly drained or has poor structure or texture that doesn’t allow for proper growing, we have come up with methods to improve such areas. Extra drainage by perforated pipes (drain tiles) and raised beds for the crops’ roots come to mind. Fall and winter provides us with a chance to improve, repair and increase capacity in this respect. At the same time, this may limit water availability in the dry summer months and we need to be prepared to irrigate. Through the incredible efforts of growers, enabled by government programs like the Environmental Farm Plan, we find ourselves outfitted to do an excellent job at water movement. Also, we are being more water wise to preserve our water supply, such as switching irrigation methods with targeted irrigation cycles. And…here is a new one for you: our groundwater wells now need to be registered and there is great incentive to do so before a March deadline, otherwise it will be costly. Information is available on the BC Ministry of Agriculture (BCMA) website and distributed through associations as well. Orders were due a while ago—unless one wants to settle for varieties that are plentiful but may not be appropriate to the farm plan. So here’s to planning at least two years ahead on that front! 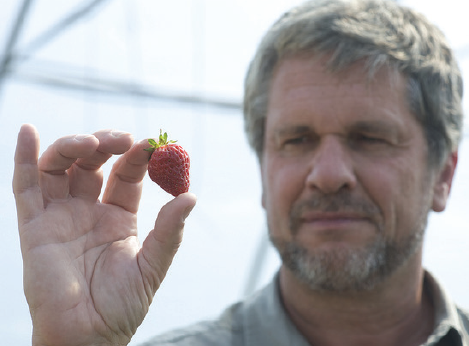 On this topic, all eyes will be on the presentations at the Lower Mainland Horticulture Improvement Association (LMHIA) Growers’ Short Course at the Pacific Agriculture Show in January, where so much information regarding varieties and their flaws and benefits will be talked about in the sessions, amongst attending growers, and of course with the suppliers. Behind the scenes, suppliers and breeding programs are meeting to anticipate grower needs and ascertain which new varieties should move forward, which should be dropped, and what plant numbers look like for nurseries in 2017, 2018 and 2019. The breeders and suppliers have involved key growers in their decision-making process to evaluate the varieties in fields under grower husbandry rather than just on the breeding program plots. Taste trials; machine harvest trials; disease, pest and physiological disorder trials have been conducted to make better recommendations to growers. Food and farm safety is on the mind of processors, packers, and fresh market outlets, as well as the grower. What worked last year and what didn’t? What incidents happened and how can they be avoided? Are fertilizers, pesticides, and fuel supplies stored properly? Is the sorting equipment capable of taking out contaminants? Are employees properly trained in food and farm safety? The processors and packers will update their requests to the growers and give presentations and training sessions, and growers must familiarize themselves with the latest rules and regulations. Now is the time to do this—not when gearing up for field work. Reviewing records is crucial to ascertain compliance. During my career as an auditor, I have seen the flaws in some systems and made growers aware of them. Teaming up with a neighbour or friend to look over each other’s systems works well. Equipment is always on the top of the list for growers to review, fix and update. However, it is just too easy to relax and procrastinate till spring, as we are all tired from a very busy season. Again, this is the time to attend shows and visit dealerships to find out just what to replace the old tractor with, and learn about the new tools of the trade. At the very least, it is important to winterize so that lines do not freeze up on machinery, make sure vulnerable irrigation parts are brought into the warm workshop, and whatever equipment can be is under cover, out of the rain and cold. Ordering supplies might not really be on anyone’s mind right now, but consider things like designing a new logo for flats, or ordering cardboard boxes, signage, fertilizers, chemicals, pails, oils, and parts for repairs now instead of waiting for the mad rush with everyone else in March. More time to think about it, more time to compare deals, and make an informed choice. There are so many websites that can help with a checklist of all that will be needed for your operations. I already bought parts for the mower and we are updating our gate and security cameras. It’s the perfect time to review property, liability and vehicle insurance. A quick check with the broker will reveal which updates are necessary and answer questions like: “Are the new tools and machines covered?” “Are you doing anything differently that might lead to risk that needs to be mitigated?” “Have you reviewed production insurance?” The deadline is usually the last day in October for most coverage. What about any other insurance programs you take part in to mitigate your farm or personal risk? Have you got the vehicles covered properly? Are trailers and other machinery that go on public roads insured properly? Hives need to be booked sooner rather than later. Depending on winter survival, there may be plenty, and then again there may be a shortage. No bees, no pollination, no fruit. And relying on the neighbour’s bees would be to the detriment of both farms. The BCMA production guides contain sections on bees that show exactly how many hives there should be per acre, and even how many bees are needed for a strong hive. The production guides are mostly online and free and get updated whenever new information comes to light, so it is easy enough to be up to date. With all the associations, BCMA, packers and processors, and suppliers, if you wanted to go to a meeting a day, I am certain you could! I encourage you to hit as many of these meetings as you have time for. This is where you receive the latest information, and where the policy-changing work gets done. It’s important to not only be up to date but actually have your say instead of wondering in the spring how decisions were made over the winter. There are so many familiar faces I encounter at each meeting—all dedicated to work for the entire industry. Each time I find myself somewhere other than home—even in the tropics—I visit with extension services; attend farmers meetings, the farmers markets; visit produce stands, suppliers’ stores, machinery sales places, processing facilities, packing houses, and the like. Whoever travels with me usually shakes their head and wants to go to the beach instead. On returning home, I speak to our suppliers about something that I found abroad that has potential value for our industry. And besides, it is good to get away to another environment once in a while. If you aren’t able to keep at least several key people who can cover essential jobs at the farm, you must take time to examine what might be wrong. How did last season go? Did you have enough trained people? Where are the weak spots and the strengths? What are the updates to the various worker programs? These are all good questions to begin reviewing the human resource component of the farm. And, as always, keep WorkSafeBC and FARSHA in mind for information and coverage. These are only ten points to consider when preparing for next season. I am certain that growers can come up with many more items that are best attended to now rather than later. I hope to see you all at the annual Growers’ Short Course arranged by the LMHIA and BC Ministry of Agriculture as part of the Pacific Agriculture Show in January—ditto for the livestock producers. I look forward to the exchange of information. Until then, stay dry and safe! SUBSCRIBE – don’t miss another story!